Detailed Product Description Gypsum rotary calciners are continious type and runs on coal,gas. IT works on gasifire which produces the gas from the coal. Prominent & Leading Supplier and Manufacturer from Mumbai, we offer Ungrouped such as Gypsum rotary calciner 50 MT Per day for India Mini Gypsum Powder Plant 50 Mt, Retarders For Gypsum Plaster, Gypsum Paperface Board, Retarders Gypsum Plaster, Joint Filler Plaster and many more items. 01. Jaw Crusher to crush gypsum rock into smaller size which is suitable for the Grinding Mill. 02. No.02 Bucket Elevator transport the gypsum rock into the vibrating feeder. 03. Vibrating Feeder transports the gypsum rock into Grinding Mill evenly. 04. Grinding Mill grind gypsum rock into fine raw gypsum powder. 05. No. 05 Electric Control Box control the NO.01 to NO.04 machines' motor. 06. NO.06 Screw Conveyor transport the raw gypsum powder into the Big Silo between Grinding Mill and Rotary Kiln. 07. The Big Silo between Grinding Mill and Rotary Kiln separates the whole Plaster of Paris Plant into two relative independent parts. 08. 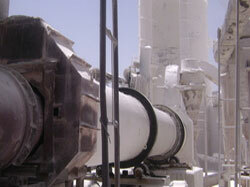 NO.07 Screw Conveyor sends the raw gypsum powder into Rotary Kiln evenly from the big silo. 09. Rotary Kiln calcine and make the raw gypsum powder to be plaster of paris powder. 10. NO.09 Bucket Elevator transports the Plaster of Paris powder into the big silo behind the Rotary Kiln. 11. Coal gas producer generates and send coal gas into the furnace which surrounds the rotary kiln. 12. Furnacesurrounding the rotary kiln is made of fire brick, fire clay, normal brick, cement, etc. When Installation, our engineer will guide your workers to make it at the spot, and you need to supply the related raw materials. 13. Temperature Gauge is used to measure the temperature inside the rotary kiln, and then we can control the temperature inside the rotary kiln, and make sure the quality of plaster of paris powder. 14. Big silo behind the rotary kiln is used to store the plaster of paris powder. 15. NO.12 Electric Control Box is used to control the NO.06 to NO.11 machines' motor. Note: Rotary Kiln includes Rotary Drum, Main Motor(includes 11kw motor), Blower(Includes 4kw motor), Cyclone Separator, Air Pipes, Foundation Bolts. Function: To produce coal gas for the furnace surrounding the rotary kiln. Function: To measure the temperature of the furnace so as to control the temperature inside the rotary kiln. Function: To control all the motors in the Plaster of Paris Plant.